July 12, 2016 Tallinn - Global CAD/CAM provider, MIP Ltd, has announced the availability of the latest version 19.50 of SpaceCable, its industry-leading wiring and harness design 3D CAD software. SpaceCable 19.50 contains many new strong capabilities for the design and manufacturing of cable harnesses. Sinan Akyar, head of technical management at MIP, mentions that the main reason more and more companies adopt SpaceCable is the uniqueness of the product. In SpaceCable all possible 3D Cabling technologies for the harness design are included, like auto-routing, bi-directional interfaces to ECAD solutions, flattening of the the harness for the cabling manufacturing, management of electrical libraries and several others. Then he continues “Today, due to the recent industrial developments, more and more mechanical products are already including electrical content, thus wiring harnesses, being the backbone of electrical systems, are also getting a great importance for the mechanical industries. 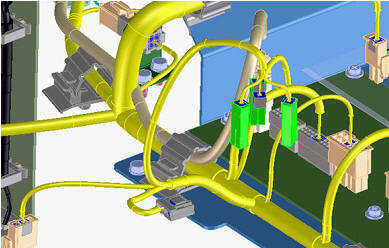 Nowadays a close collaboration between mechanical and electrical design groups is already a reality". Terminal functions are rewritten completely. Terminal definitions and snaps are now similar to connector definitions. All functions involving connectors are now also working in the same way for the terminals. 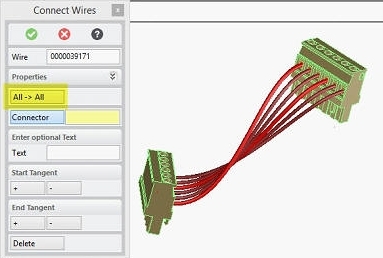 Now all library components like connectors, fixtures and terminals as well as counterparts of snap pairs and loaded parts from ECAD Browser can be directly loaded from Windchill. For this there is now a new CCF keyword “LWC” for loading from Windchill. Now it is possible to define exact complete wire lengths or add an extra length simply by applying information to channel segments and wires. This information stays on the object even the segment or wire is modified. Pre-assembled cables with a single part number can now be declared. It will appear as a single entry in the BOM. Now is possible to twist unlimited number of wires together. 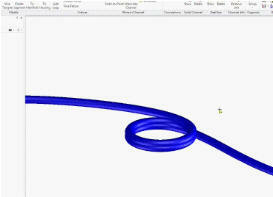 In a secondary twisting the already twisted wire groups can be even twisted together. 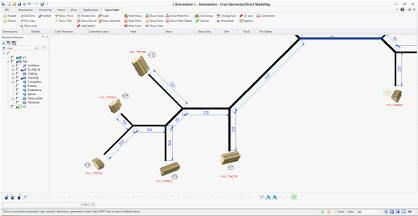 User can create now real size harness manufacturing drawings. 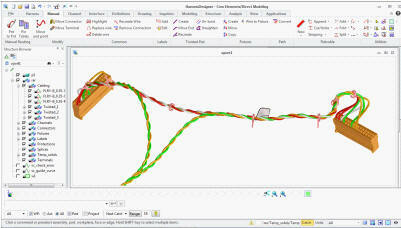 Harness segments can be bended and rotated for reducing the drawing size. 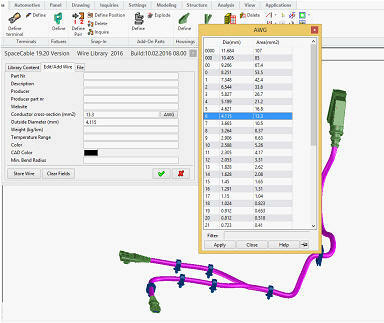 Cable ties and fixtures on the 3D Model are now transferred and dimensioned in the Annotation drawing. While defining the wires AWG input tables can now be used. American wire gauge (AWG) is a standardized system used for the diameters of wires. The cross-sectional area of each gauge is an important factor for determining its current-carrying capacity. Increasing gauge numbers denote decreasing wire diameters. 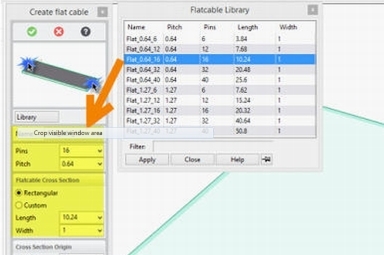 For standardization and quick selection users can now define most common flat cable (ribbon cable) types in a library. Library definition is simply done in the customization file. With one click users can now connect all pins of two connectors without selecting pin by pin. Later individiual connections can be deleted or modified. 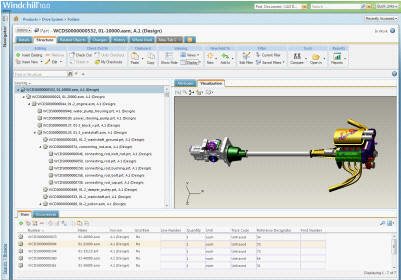 Founded in 1994, MIP Ltd (abbreviation for "Manufacturing Integration Products") develops and markets CAD/CAM/PDM software for the cabling and harness design, aluminium extrusion die design, mechanical engineering, manufacturing and product data management, which are the leading edge and easy-to-use. With a broad experience and several hundreds of installations worldwide, MIP distributes and supports its products through its own offices and a worldwide reseller network. 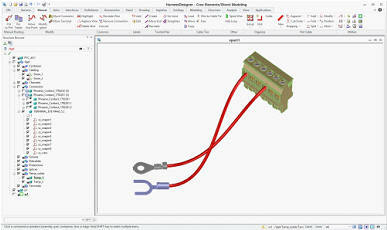 SpaceCable is a 3D CAD Harness solution, which enables mechanical and electrical designers to work concurrently together. This sharing of data provides accurate 3D digital virtual prototypes and allows designers to evaluate design decisions within the overall electromechanical environment.